Water. World’s most common element. What would we be without it? Probably dried out. 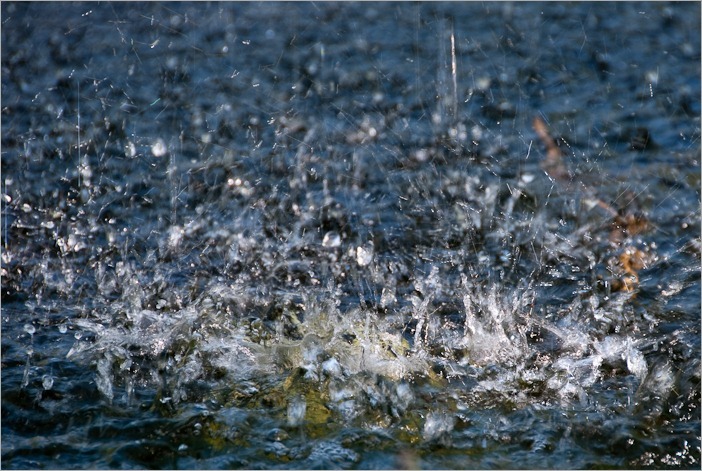 In photography, water also holds its place. Of course not only in the darkroom where the chemicals are mixed with water to obtain your film’s and paper’s images. It also exists far before the processing of your material. Let’s go outside and forget about the darkroom. Too smelly anyway. In Winnipeg, we don’t have much time to contemplate open water, apparently the season is too short for this. Frozen water, yes, we know all about it. See Freezing Craftsmanship for this. We got lots of experience with that. Now, liquid water is a whole different approach for photographers. Some people like the reflection of objects in the water, but what about the reflection of water in itself? That looks more like chaos to me. But nice and shiny. Here in Winnipeg, we have all kinds of quiet water, so I thought I’d start with something more wild. Quiet water is much more common, but to find something really quiet you need to go out of the city. 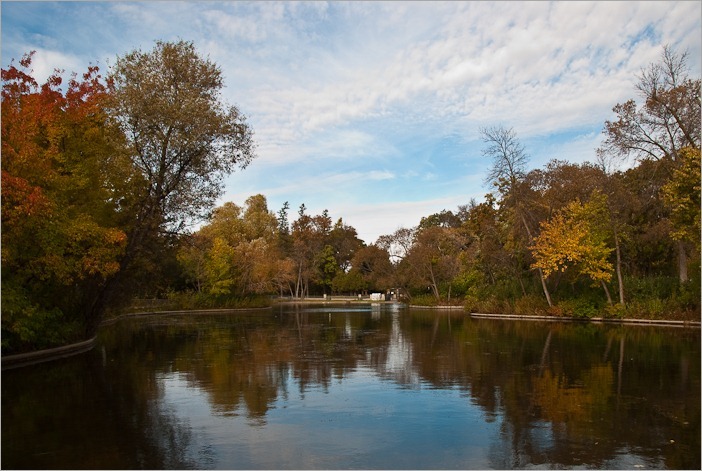 Here in Beaudry Park, the water was turning into ice. Only very small pieces and floes stuck together. The water not being too cold yet, and the air still too warm, the formation of the ice was interesting. The pieces pushing each other through the water, you could hear a soft swishing sound, very quiet and soothing. 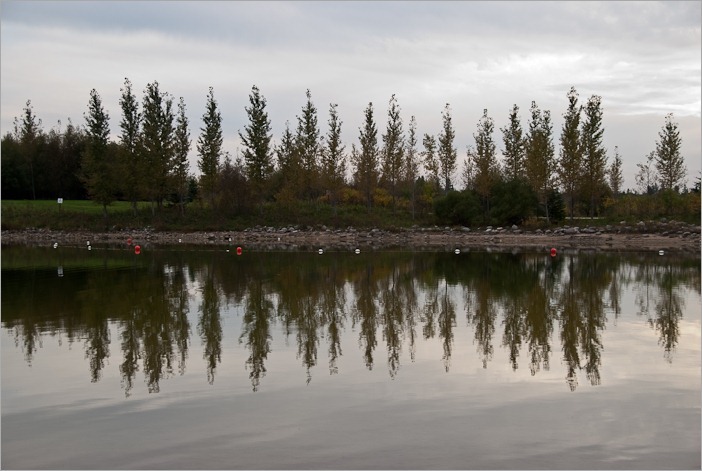 Of course, other reflections are found on little lakes or ponds and can give very nice results like here in Dubinka. But you don’t have to go to Ukraine to have nice pictures. In Birds Hill Park the reflections are just as good. A little Fall color and the picture is nice enough to be hung on your wall. But really moody pictures can also be had in winter. Ok, all is frozen… not really. 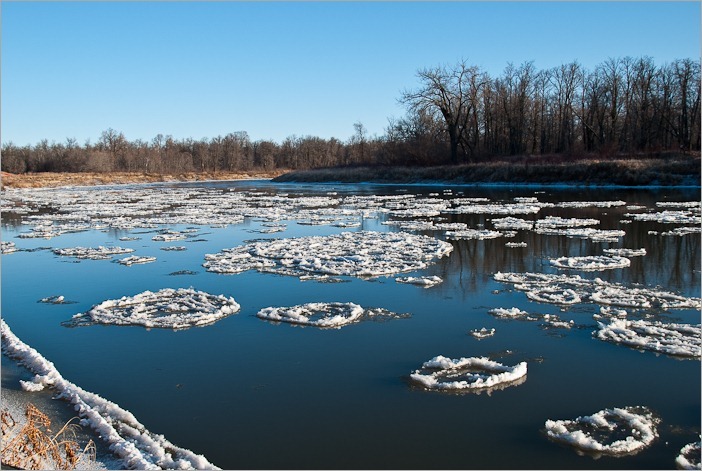 Manitoba Hydro is using the Winnipeg river for cooling. As a result the water is warming up and will mostly not freeze in winter. Not even when it’s –25C out there. Probably this will make a change in the micro climate around the river, but we all have to have our energy. 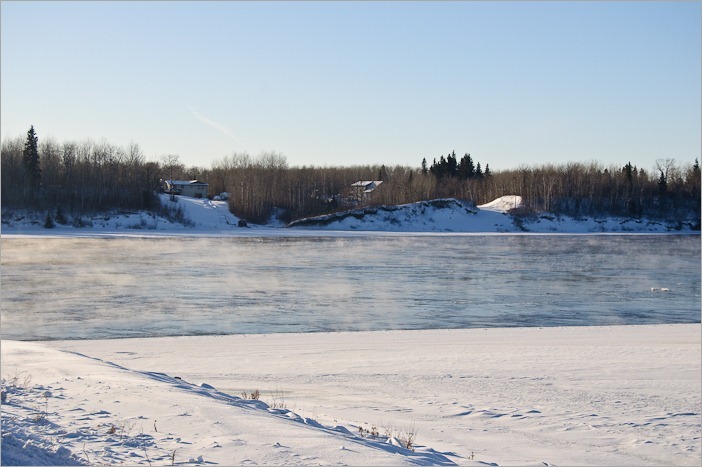 In winter, however the Winnipeg river may present itself in a shroud of mist, thanks to the difference in temperatures of air and water. No skating here, but a nice and simple picture of a quiet place.